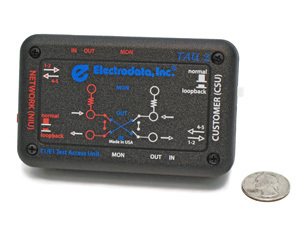 Home Page - Electrodata, Inc.
Handheld T1/E1 Troubleshooting Tool TAU 2 provides the test access capability of a cross-connect panel (DSX), in a small, convenient, handheld package. It provides a complete set of MONITOR, IN and OUT bantam jacks for both circuit directions from the test point. In addition, TAU 2 provides simple switches to loop-back the circuit in either direction. View the datasheet (PDF). 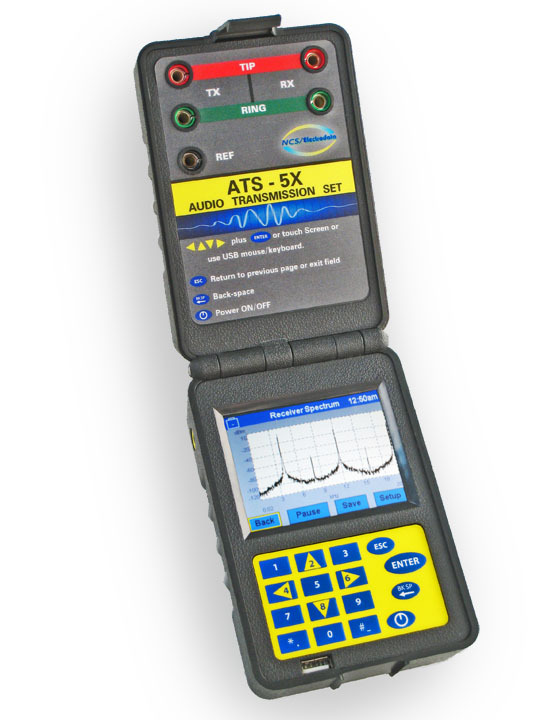 Introducing the ATS-5X The NCS/Electrodata ATS-5X is a handheld test instrument for complete troubleshooting of audio frequency impairments on communication networks. An intuitive menu, rugged construction and a bright, clear LCD touchscreen make control and operation an enjoyable process. The ATS-5X measures transmission quality and impairments in the frequency range of 50Hz to 20kHz. Use the ATS-5X to verify signal levels and transmission quality or to identify sources of noise, distortion and interference. Measurements include: Spectrum, Longitudinal Balance, Impulse Noise, 23-Tone and Echo. The ATS-5X can function as a telephone handset with dial capability and it can capture DTMF digits which are then analyzed for twist and skew. Captured tests may be stored to your USB device for later analysis or documentation. Simple controls and sophisticated test solutions mean ATS-5X will enable you to troubleshoot your audio network problems quickly and with ease. Download the complete specifications (PDF). Electrodata will discontinue several products effective 1/1/2018. Copyright © 2015 - 2019 Electrodata, Inc.